Aficionado of both new and early music, lutenist and classical guitarist Adam Cockerham is known for his moving solo performances, his nuanced ensemble work, and sensitive accompaniments. As a finalist in the 2011 Carmel Society Instrumental Competition, his performance was regarded as being “beautifully and effortlessly executed” by Peninsula Reviews. 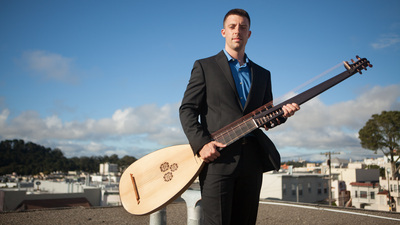 In 2013, Cockerham was the winner of the San Francisco Conservatory Baroque Ensemble Concerto Competition and performed Vivaldi’s Lute Concerto in D Major with the orchestra. Cockerham was the first lutenist to attend the 2012 American Bach Soloist Academy, a two week advanced training program for emerging professionals and accomplished students of historically informed performance practice. He was invited to participate in the the academy for a second year in 2013. Cockerham received his Bachelor of Music Degree and Master of Music degree from the San Francisco Conservatory of Music with a Secondary Emphasis in Historical Plucked Strings. While at the conservatory, Cockerham studied guitar with Sérgio Assad, David Tanenbaum, and Lawrence Ferrara, and theorbo, lute, and baroque guitar with Richard Savino. Cockerham has performed in guitar master classes with luminaries such as Oscar Ghiglia, Odair Assad, Manuel Barrueco, Ben Verdery, Dale Kavanagh, Paul Galbraith, and Michael Newman, as well as period-instrument master classes with Nigel North, Hopkinson Smith, and Pascal Valois. Partnering with acclaimed mezzo-soprano Danielle Sampson, the two founded Jarring Sounds, a voice and guitar/lute duo in 2011. Cockerham is currently pursuing a degree in Historical Performance at the Juilliard School.